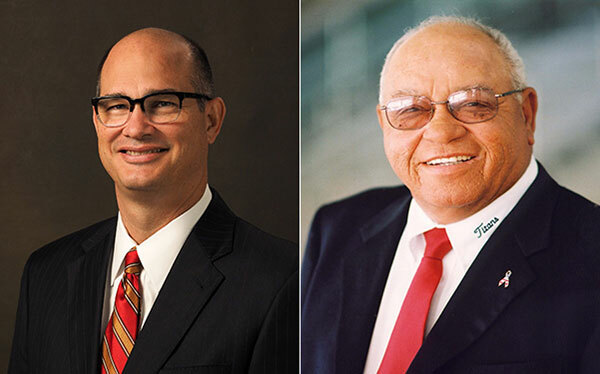 Steve J. Daugherty, CEO of Coliseum Northside Hospital, and Herman Boone, the legendary high school football coach portrayed in the movie “Remember the Titans,” are the commencement speakers for Middle Georgia State University's spring 2017 graduation ceremonies scheduled for May 10-11. Daugherty will speak at the 2 p.m. Wednesday, May 10, ceremony for graduates of MGA's School of Health Sciences. Boone will speak at two ceremonies: 10 a.m. Thursday, May 11, for graduates from the College of Arts & Sciences and the Georgia Academy, and 2 p.m. Thursday, May 11, for graduates from the School of Aviation, School of Business, School of Education and School of Information Technology. All ceremonies will take place in the Recreation and Wellness Center on MGA's Macon Campus. About 600 students total are candidates for graduation. Daugherty is the CEO for Coliseum Northside Hospital in Macon and interim CEO for Coliseum Medical Centers. Originally from Oklahoma, he has more than 18 years of administrative experience with HCA Corporation, much of it spent in Florida hospitals. He arrived at Coliseum Northside Hospital in 2014. Previously, he served as an acquisition specialist for the HCA West Florida Division, CEO at Northside Hospital in St. Petersburg, FL, CEO at South Bay Hospital, COO at St. Lucie Medical Center and vice president/administrator at Gulf Coast Hospital. He received his MBA from Florida Gulf Coast University and his B.S. in Biology from Augustana College in Sioux Falls. Daugherty also has a diploma in Medical Technology recognized by the American Society of Clinical Pathologists. He serves on several boards in Macon, including United Way of Central Georgia, the Otis Redding Foundation and the Greater Macon Chamber of Commerce. Speaking at all three ceremonies will be Rachel Hastings, the 2017 President's Scholar. Each year, a graduating senior is chosen by the Honors, Awards and Graduation Committee, with the approval of the University president, to be the President's Scholar. The chosen student must have an outstanding academic record, involvement in campus and/or community service activities, and demonstrate characteristics indicating the promise of a successful future. In addition to Hasting's accomplishments as an Honors Program graduate, she served as president and vice president of the Honors Student Association, a student administrative assistant in the English department, a work study intern for NewTown Macon, and an assistant in the University's Mac lab. Hastings graduates from MGA with a Bachelor of Arts in New Media and Communications. She plans to pursue a master's degree in Film Studies. Also speaking at all three ceremonies will be the MGA Alumni Association's representative, Kaitlin P. Hinson, an attorney in Milledgeville. Hinson graduated from what is now Middle Georgia State University in 2010 and went on to Mercer University to earn her law degree. Before joining the firm of Cansino, Stribling, & Cook, LLP as an associate, Hinson worked as an assistant D.A. in the Macon Judicial Circuit, juvenile division. Her practice focuses primarily in the areas of divorce, child custody, and juvenile law. She is a member of the National Council of Juvenile and Family Court Judges. A Macon Campus map and directions are at http://www.mga.edu/about/maps.aspx. Middle Georgia State University, with campuses in Macon, Cochran, Dublin, Eastman and Warner Robins, offers master's and bachelor's degrees, along with a select number of associate's degrees. Photos: Steve Daugherty, left, and Herman Boone.